BIES is a newly launched monthly meetup to promote entrepreneurship at the convergence of biology, medicine, and computing. 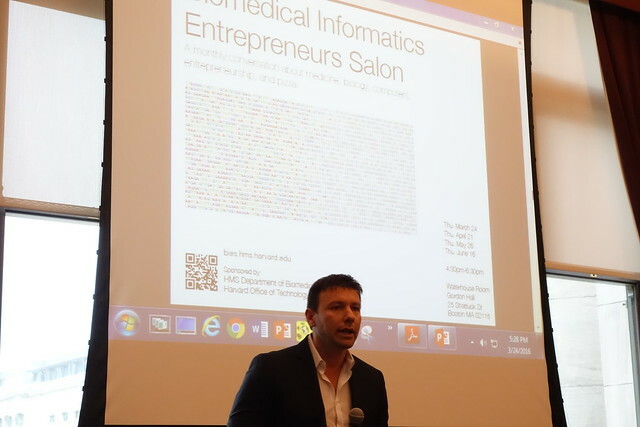 DBMI and the Harvard Office of Technology Development (OTD) have joined forces to launch the Biomedical Informatics Entrepreneurs Salon (BIES), a monthly meeting to promote entrepreneurship at the convergence of biology, medicine, and computing. Our inaugural meeting (gallery below) was held in the Waterhouse Room of Gordon Hall at HMS and featured talks by Aman Bhandari, PhD, Executive Director of Data Science and Insights at Merck; and John Boyce, CEO of Exosome Diagnostics and former CEO of GnuBIO. In April we will hear from David Altshuler, M.D., Ph.D., Executive Vice President, Global Research and Chief Scientific Officer, Vertex; and Luba Greenwood, JD, Vice President, Global Mergers & Acquisitions and Business Development at Roche. Each monthly meeting will include opportunities for networking as well as a quick pitch session, which is a chance for participants to speak up, share their current interests and seek potential collaborators. Also, pizza! BIES was developed under the leadership of Steve Strassmann, PhD, Visiting Scientist and Entrepreneur in Residence at DBMI; and Michal Preminger, PhD, MBA, Director of Business Development for OTD at Harvard Medical School. Meetings are open to everyone. Tickets are free but limited. Visit the BIES website to learn more, RSVP, and sign up for the mailing list.